Many times we land on informative webpages that can be useful in future. To save such pages, either we can bookmark them or we can save the complete webpage in HTML or PDF format to read them later. In the same way, sometimes we encounter important posts in our Facebook account. Now the question is, how we can save those posts? 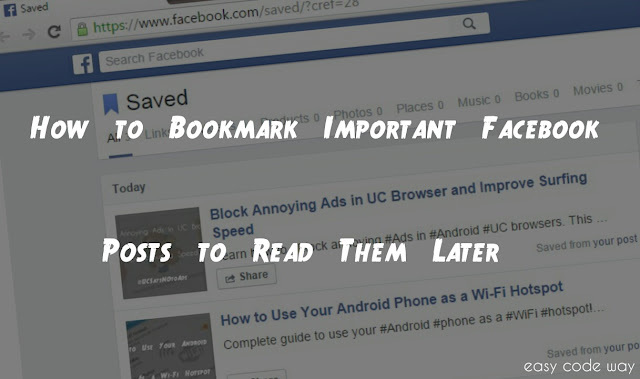 Of course, you can bookmark individual Facebook post in your browser and most probably, you'll opt this method but let me ask you one more question. What if you're unable to access your browser. For example, In case you uninstalled it or you moved to another device from where you can access it. 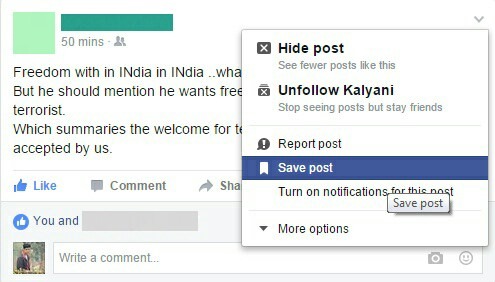 To overcome this problem, Facebook has another option using which you can save any post to read it later. This means that you'll have online record of your post and you can access it anytime simply by logging into your Facebook account. This tutorial will guide you everything about this feature. Now lets start from basics. Before moving to the steps. First let me introduce you with this "Save" option. Actually when you will save any post, it will be added to the saved list from where you can access it anytime. Post here means any photo, status, link or video. Apart from this, you can also add events and pages to this list. From menu list, click on "Save" option. Suffix can be "post" or "link", depending upon the type of post you've selected. For mobile app users, steps are same as mentioned above. 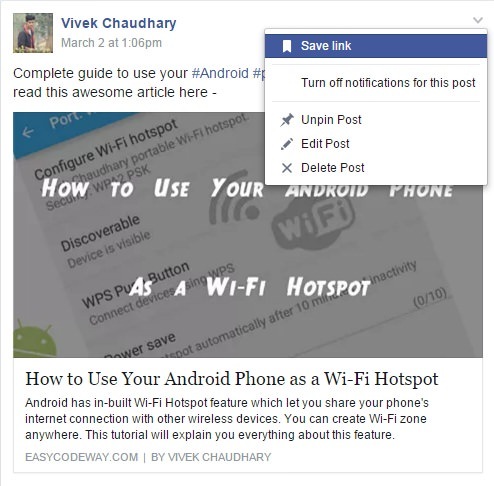 Note: At present, this feature isn't available in Facebook lite app. It's very easy to find your saved posts. If you're on desktop browser then go to home page and click on "Saved" option from favorite list (available in the left sidebar menu). 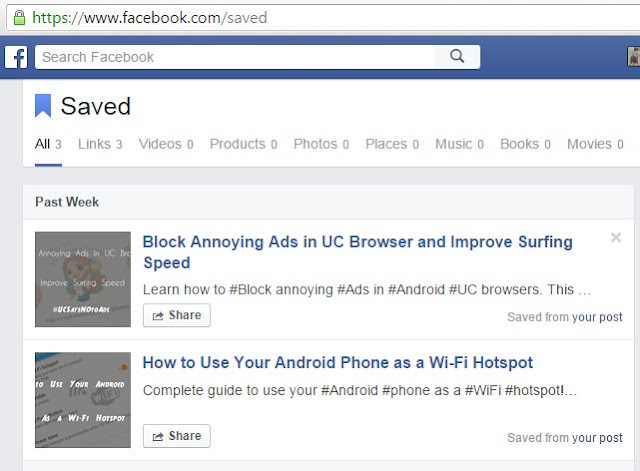 Alternatively, you can move to facebook.com/saved link. Here you'll find all items you've saved. You can also share them on our timeline. To remove any post from this list, you have to archive it first. For that, hover to the item and click "X" icon. Now If you want to delete it permanently, then move to archive tab and click on three dots available next to the item and finally select "Delete" option. For mobile app users, this process is quite different. First of all, open fb app and move to its menu. Here you'll find "Saved" option. Open it and view all your items. 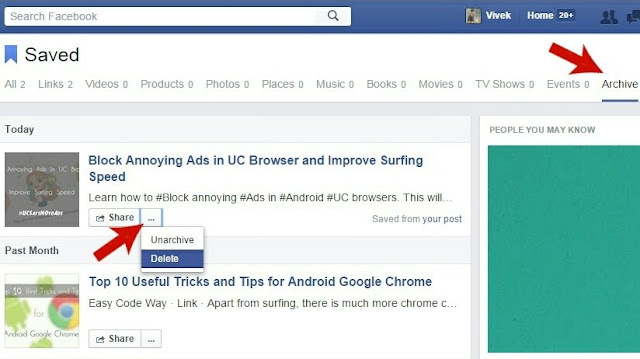 Again, if you want to delete any post than archive it first and only after that you can remove it permanently. To do this, click on "three parallel lines" icon, available next to the item and select "Archive" option. After this, open archived section and again click parallel lines icon and select "forever delete" option. You can follow on-screen instructions. It's very simple, so better try it yourself. Now I just hope that you've complete knowledge about this Facebook save feature. If you have any questions, please let me know in below comment box. I am always here to help you. Stay tuned for more interesting tutorial!